Choosing the right roof is an important step for any homeowner in Miami. Not only does your roof define the overall look and style of a home, it also protects the house and its residents from harsh weather conditions. 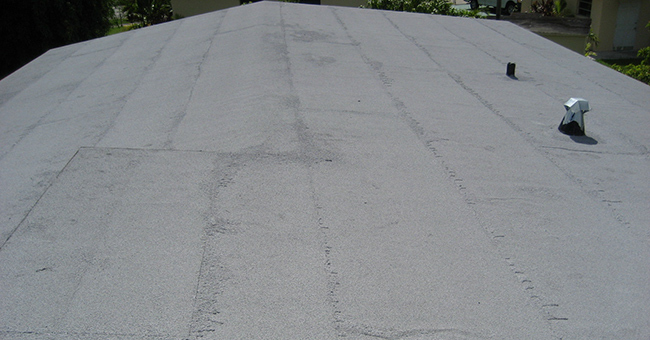 There are several roof types to choose from, but a familiar sight in South Florida are flat roofs because of the unique appearance they provide, and the absence of snow. Whether you are choosing a roof design for a new home, or replacing a current flat roof, we’ll help answer many of your flat roof-related questions. Most flat roofs are not entirely flat – they are low-sloped roofs that appear flat but have a little bit of a slope to allow for the run-off water. Often referred to as commercial low slope, flat roofs are commonly used for commercial and industrial buildings because it can be easily installed over large surfaces. This roof type is also commonly found in modern architecture style homes or home additions. Flat roofs are less expensive to install because there is less surface area to cover than on a pitched roof, which saves on labor and material costs. Maintenance also costs less for flat roofs because they are easier to get to and walk around on than a pitched roof. Flat roofs are an attractive aesthetic choice that gives homes a unique look. They are frequently used on modern and mid-century style homes. Flat roofs also allow for a more efficient use of top-floor space in buildings. The open space offers the opportunity to install applications such as solar panels, and air conditioning units can be placed above a property instead of the ground. It can also be used for projects like rooftop gardens, patios, or gardens with proper design considerations. Flat roofs are easier to maintain and a cost-effective option for homes. There are plenty of modern materials and application techniques that provide extra protection and allow the roof to last longer. By hiring an experienced professional to build and install the flat roof, along with regular maintenance, this roof type can be reliable for several years. It is harder to replace a flat roof than a traditional pitched shingle roof because of the labor required to peel back its layers (especially on aged flat roofs). However, these days flat roofs are often constructed with fewer layers because of improved waterproofing technology. This might mean that flat roofs may not raise the same red flags they used to among prospective homeowners who may want to replace or remodel the roof once they move in. Flat roofs that are poorly installed or inadequately maintained can fall prey to leakage, and the subsequent rot and damage. By working with a skilled team and performing regular inspections, you can avoid the risk that water might pose. Flat roofs are typically installed via rolled roofing and use a combination of typically inexpensive and easy to install materials. The typical lifespan of a standard flat roof can exceed 10 years; however, new and more expensive methods utilizing PVC, rubber, and polycarbonates can extend the life of a flat roof and offer design choices (at a higher cost). As with any type of roof, if you are interested in installing a flat roof on your South Florida home, be sure to consult with an expert roofer to help assist with the decision-making process. Our trained staff at T&S Roofing Systems is especially equipped to construct a protective and lasting roof system for your home in Miami.